Sometimes it can be helpful to import a project into another one in case two teams used to work on separate projects and now work together. First you have to open the main project that you want to add an existing HoloBuilder project to, and you have to be in the Edit mode. Once you are in the Web Editor, press the + button in the lower left corner. 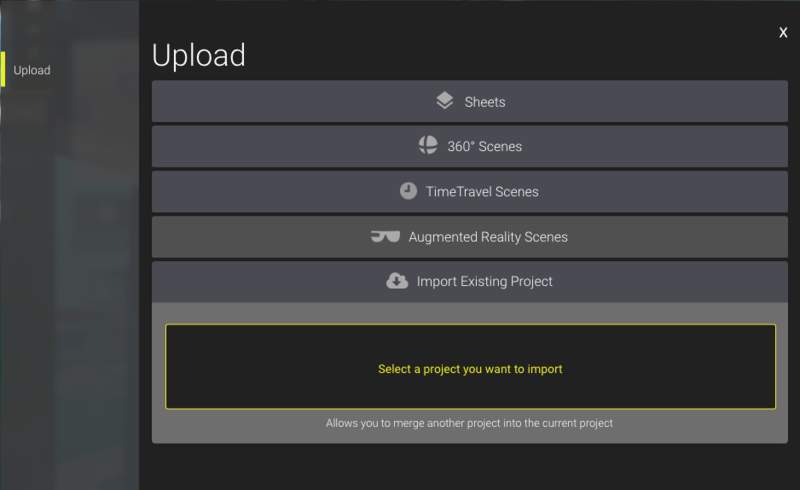 Once the Upload dialog opens, select 'Import existing project' as shown below. When you click on 'Select a project you want to import' a new dialog will open where you can select an existing project from your account. Choose the project from the list by clicking on it and then click on the 'IMPORT' button in the lower right corner. All sheets and 360° images along with their time travels have now been added to your current project.